STUNNING! Here is a fine property waiting for the new owner to move in. 3,400 plus approximate square feet. 4 bedrooms with an option for a 5th, 3.5 baths and large spaces. Travertine in Kitchen and FR, hardwood floors throughout. Kitchen has granite, large work spaces, lots of cabinets, two dishwashers and wine/bev centers, built-in refrigerator, appliances in Stainless Steel, 6 burner cook top and more. All the amenities a cook is looking for. Kitchen opens to large family room ====see supplement====, with built in cabinets. Kitchen, family room, living room and dining room flow easily for entertainment. Large dining room capable of handling an oversized crowd. Fireplaces in living, family and master bedroom. Fireplace in living room is a see thru to the covered patio. High ceilings. Large laundry room. Plenty of recessed lighting and a nice selection and placement of spot lighting. Additional kitchen amenities are: Double oven, microwave, pantry, reverse osmosis system, water filling faucet at cooktop and breakfast bar. Two bedrooms are arranged in Jack and Jill configuration. Master bedroom is large and features include a ceiling fan, with double closets and a larger master bath with a jetted tub and large double shower. Ceiling fans throughout the house, including with the covered patio. 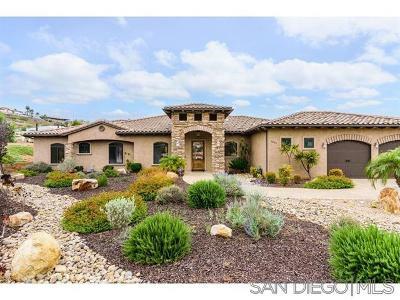 Dual pane windows, exterior in stucco and stone and the roof is tile. Two zone heating and cooling. Most closets and large area in garage with Elfa built in shelving system. Driveway is in pavers leading to a good sized 3 car garage. Services for welder in garage. Fire pit, low water landscaping and lots of outdoor living space complement this home offering gracious living. Leased solar system (buyer to qualify for lease transfer). Outside storage closets. This home is near the end of a cul de sac in a gorgeous part of Blossom Valley. If you are looking for a single story home that will make you feel comfortable at the outset, this is it. Show with confidence.